The Shantae series had a rough start back in 2002. Releasing on the GameBoy Color right after the GameBoy Advance’s release wasn’t too fortunate of a plan and it was forgotten until 2010’s Shantae: Risky’s Revenge on the Nintendo DSiWare store. (It’s complicated, just get the director’s cut on console.) Then came Shantae and the Pirate’s Curse and now Half-Genie Hero. This game was funded by Kickstarter in October 2013, so is it worth the three-year wait? Our hero is the half-genie Shantae, who is the guardian of Scuttle Town residing with her Uncle Mimic who’s working on a new invention called the Dynamo. Now her job is to help her uncle build the machine by finding the right parts throughout the game world. While building the machine is the main objective, the story itself is all over the place with different characters, issues that are resolved and never brought up again, and quick-pacing that is a dream for speed-runners. It’s worth noting that this is the first game in the series designed from the ground up for HD consoles, and it shows with its artstyle. 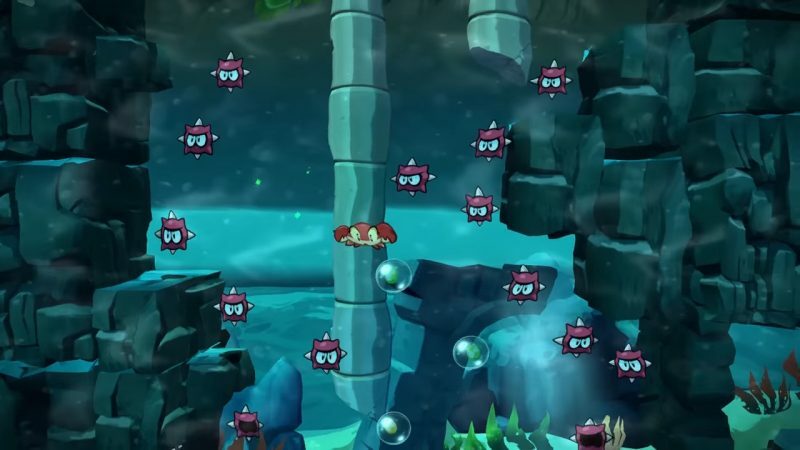 Half-Genie Hero retires the sprite-based style of the previous games and adopts an animated one with 3-D backgrounds and platforms. It maintains 60fps while rarely encountering dips. The music is also really good. If I had to compare it to another game’s music, it would be the classic Sonic the Hedgehog titles. Fast, upbeat, and impossible to not dance to! Shantae can be considered Metroidvania, but Half-Genie Hero tackles it a little differently. Areas in the world play out like traditional 2-D platformers with a beginning and end. They each have three different sections with a boss battle at the end during your first run. When you return to them to find items, you’re going to have to go through the entire level until you buy a teleporter that will take you to the next section. It gets rather tedious in the beginning, but the game only gets easier the more you level up Shantae. Speaking of that, it’s really easy to level up Shantae. The shop in Scuttle Town is the place to go if you want to make her the best she can be. There you can buy fireballs, the aforementioned teleporter, shields, you name it. Since it’s really easy to acquire money, it’s just as easy to level up Shantae early on. This makes the game way too easy; even when you get to the harder levels, you can simply ponytail-whip a horde of enemies out of your way thanks to your enhanced speed and power. Not to mention there are multiple heart containers in every area. Despite how easy it is, I’m a fan of exploration and Half-Genie Hero delivers in that regard. 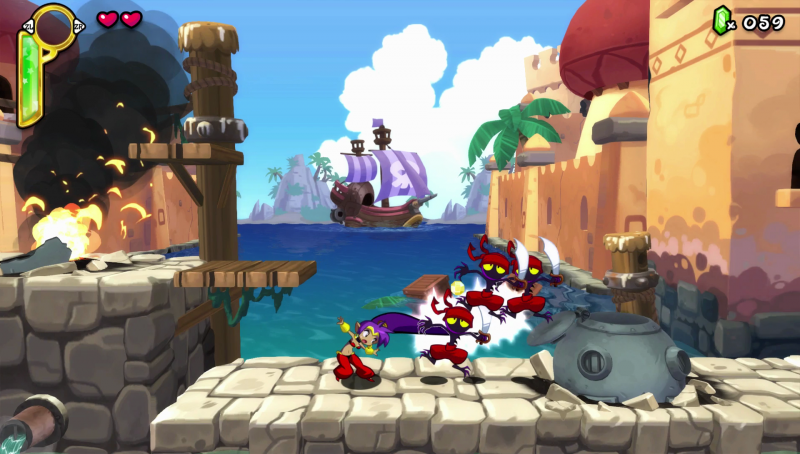 Shantae will gather a number of dances during the course of her journey that will transform her into different animals like an elephant, mermaid, or bat. There’s even one for a tree if you want to grow fruit for some reason. Animal transformations will help you reach areas regular Shantae can not. An elephant can break through weak walls, a mermaid can swim underwater, a bat can…fly. You can buy some of these dances, like the tree one, at secret shops, but the best transformations have to be found and you can’t progress through the game without them. Half-Genie Hero was the first Shantae game I’ve played. Since then, I bought the other two because I liked it that much! Despite it being too easy, I wound up enjoying myself thanks to its cheerful style and emphasis on exploration. 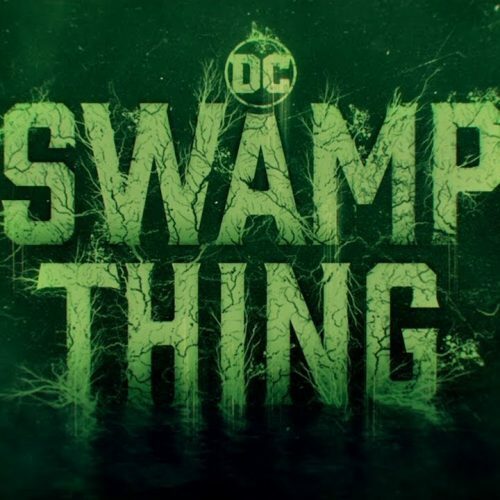 This is probably one of the biggest steps the franchise has taken to secure a bright future for itself. 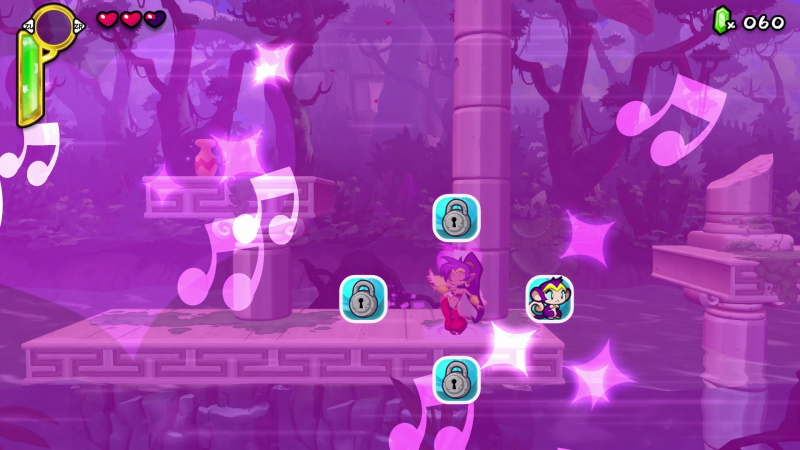 Fans and newcomers alike will enjoy what Shantae: Half-Genie Hero has to offer.